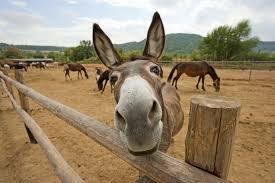 Do Donkeys Act? is not a film about stage-struck animals Rather, David Redmon and Ashley Sabin’s thoughtful playful documentary is an enquiry into what might be called "donkey consciousness." The goal here isn’t “ahhhh,” but a sense of awe. Shot over five years in donkey sanctuaries on three continents, including one near Guelph, Ontario, the film is narrated by Willem Dafoe. You might recall, Dafoe played Jesus Christ, a figure symbolically associated with donkeys, in Martin Scorsese’s The Last Temptation of Christ. The film was inspired by reading English writer Andy Merrifeld’s 2010 book, The Wisdom of Donkeys: Finding Tranquility in a Chaotic World, the author’s chatty account of refreshing his soul while ambling through the vales and bracken of southern France with a donkey one summer. Think of it as Eat, Bray, Love. Redmon and Sabin’s film is a more ambitious work, on the edge between poetic and pretension. Dafoe’s voice-over narration, aiming for profundity can drift into alliterative gibberish (“Harmonic cacophonies of acoustic communication” or “Darting donkeys flash a voluptuous gestalt.”). Of course, no intellectually ambitious donkumentary would be complete without reference to Robert Bresson’s film, Au hasard Balthazar (Balthazar, by chance), featuring a Christ-like abused donkey. But it’s the footage of the donkeys themselves, as they enter the sanctuaries, endure medical procedures, voice their hair-raising hee-haws, and gaze at us through the camera lens — that leave the deepest impression. We can’t help but identify with the animals’ fear, curiosity and trust. In a similar way, Do Donkeys Act? is as much an investigation into how we see ourselves as it is about donkeys, who, with their solemn pool-like eyes and antenna-ears, meet our gazes and compel us to reflect on what they see. Do Donkey’s Act? Written and directed by David Redmon and Ashley Sabin. Screening at Toronto's Hot Docs Ted Rogers Cinema for a one-week run starting Friday, Sept. 29. This film was reviewed last May at the Hot Docs Film Festival.